This part of our site provides information and resources for single and married young adults. Our Family and CCD pages provide additional information & resources for young families and young couples. Busted Halo is a website designed specifically for Catholic young adults. It is packed with relevant and timely videos, articles, blogs and other stuff to keep you digging deeper into your faith. The Diocese of Youngstown has an Office of Youth and Young Adult Ministry directed by Cindee Case. CLICK HERE to access the young adult ministry page. Theology on Tap is a young adult gathering at a local pub that helps young adults connect with each other and their faith in a comfortable social environment. CLICK HERE and sign in to your Facebook account to connect with the Mahoning County chapter! Are you dating? Thinking about getting married? Here's a blog from the Faith Formation Learning Exchange that might help you figure out if this relationship is the one to keep. CLICK HERE for a helpful read! If you are recently engaged, check out our Engaged Couple Page. 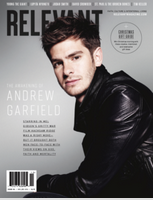 RELEVANT Magazine is an online and print resource for Christians in their 20's and 30's. You'll fine insightful articles about God, life, culture, and current events. There is free access to an extensive library of articles. Full access requires a subscription. CLICK HERE to learn about ministries you can be involved with on Sundays at IHM!